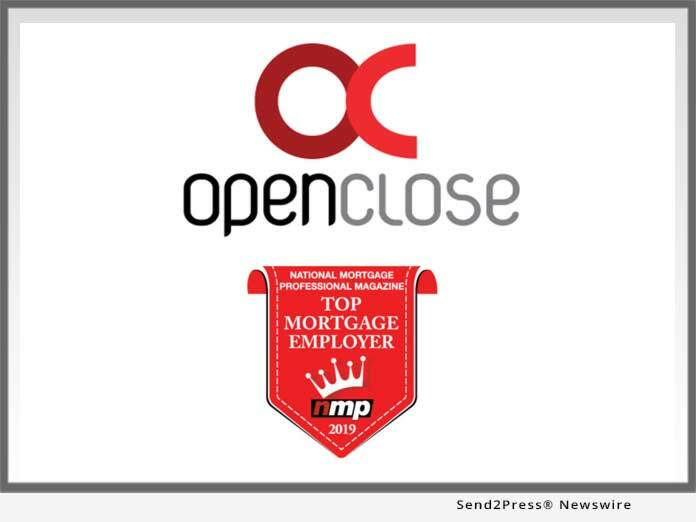 WEST PALM BEACH, Fla., Jan 30, 2019 (SEND2PRESS NEWSWIRE) -- OpenClose(R), an industry-leading multi-channel loan origination system (LOS) and digital mortgage fintech provider, announced that it was selected as a 2019 Top Mortgage Employer by National Mortgage Professional (NMP) magazine for the third straight year. "We are elated to have been chosen again by National Mortgage Professional magazine as one of the country's leading companies to work for and we thank them for the recognition," said JP Kelly, president of OpenClose. "Words cannot express how appreciative OpenClose's management team is for the immense dedication and passion that our employees bring to the table every day." NMP arrives at the annual winners by polling its readers about their employers based on the following criteria: corporate culture; compensation; day-to-day management; internal communications; marketing; training; resources; long-term strategy; ingenuity; speed; technology; reputation; and industry participation. The magazine is one of the mortgage industry's leading go-to sources for extensive news coverage for mortgage lending, compliance, secondary marketing, servicing, settlement, technology and more. Kelly adds, "OpenClose has launched multiple technology innovations over the last year and has grown significantly, in part, due to these new solutions. We have added new team members in every area of the enterprise to drive innovation and execute our mission to provide the very best service and lower the mortgage manufacturing cost for our customers. We have been fortunate to attract top-tier industry talent and winning this award is a reflection of our tremendous team and culture." Founded in 1999 and headquartered in West Palm Beach, Florida, OpenClose(R) is a leading enterprise-class, multi-channel loan origination system (LOS), POS digital mortgage and fintech provider that cost effectively delivers its digital platform on a software-as-a-service (SaaS) basis. The company provides a variety of innovative, 100 percent web-based solutions for lenders, banks, credit unions, and conduit aggregators. OpenClose's core solution, LenderAssist(TM), is comprehensive loan origination software that is completely engineered by OpenClose using the same code base from the ground up. The company offers a RESTful API suite that standardizes system-to-system integrations, making them easier to develop, quicker to implement and more cost effective. OpenClose provides lending organizations with full control of their data and creates a truly seamless workflow for complete automation and compliance adherence. For more information, visit https://www.openclose.com/ or call (561) 655-6418. National Mortgage Professional Magazine (NMP) has become "The Source for Top Originators" - that connects the mortgage professional community under various media formats. Our exceptional team of industry-seasoned monthly contributors combined with our knowledgeable editorial staff, all with meaningful expertise in their respectful disciplines, provide the most up-to-date news, insight and advice for today's mortgage professional. We are committed to ensuring that today's industry is equipped with the most comprehensive understanding of mortgage news available through our many resources, including, but not limited to, articles in the print edition of National Mortgage Professional Magazine and 38 state-specific e-editions, the NMP Daily and NMP Ticker email newsletters, the exclusive daily news stories and postings on our website https://nationalmortgageprofessional.com, and our regular series. The publication also owns and operates the Mortgage News Network (MNN), a video news source that provides mortgage firms with a resource for news and information as well as a platform for telling their story and sharing their views directly, and in person. https://mortgagenewsnetwork.com/.